Ceftriaxone, sold under the trade name Rocephin, is an antibiotic useful for the treatment of a number of bacterial infections. This includes middle ear infections, endocarditis, meningitis, pneumonia, bone and joint infections, intra-abdominal infections, skin infections, urinary tract infections, gonorrhea, and pelvic inflammatory disease. It is also sometimes used before surgery and following a bite wound to try to prevent infection. Ceftriaxone can be given by injection into a vein or into a muscle. Common side effects include pain at the site of injection and allergic reactions. Other possible side effects include C. difficile associated diarrhea, hemolytic anemia, gall bladder disease, and seizures. It is not recommended in those who have had anaphylaxis to penicillin but may be used in those who have had milder reactions. The intravenous form should not be given with intravenous calcium. There is tentative evidence that ceftriaxone is relatively safe during pregnancy and breastfeeding. It is a third-generation cephalosporin that works by preventing bacteria from making a cell wall. Ceftriaxone was discovered in the early 1980s by Hoffmann-La Roche. It is on the World Health Organization's List of Essential Medicines, the most important medications needed in a basic health system. It is available as a generic medication. In the developed world the wholesale cost per dose is about 0.20 to 2.32 USD as of 2014. In the United States a course of treatment is typically less than 25 USD. Ceftriaxone and other third-generation antibiotics are used to treat organisms that tend to be resistant to many other antibiotics. Due to emergent resistance, ceftriaxone should not be used for the treatment of Enterobacter infections. Before using ceftriaxone, it is important to determine the susceptibility of the bacteria. If sepsis is being considered, empiric therapy may be initiated prior to susceptibility testing. It is also a choice drug for treatment of bacterial meningitis caused by pneumococci, meningococci, Haemophilus influenzae, and "susceptible enteric Gram-negative rods, but not Listeria monocytogenes." In combination with doxycycline or azithromycin, ceftriaxone is recommended by the United States Centers for Disease Control for the treatment of gonorrhea. By itself, it is not recommended due to the potential for resistance development. Like other third-generation cephalosporins, ceftriaxone is active against Citrobacter spp., Serratia marcescens, and beta-lactamase-producing strains of Haemophilus and Neisseria. However, unlike ceftazidime and cefoperazone, ceftriaxone does not have useful activity against Pseudomonas aeruginosa. It is generally not active against Enterobacter species, and its use should be avoided in the treatment of Enterobacter infections, even if the isolate appears susceptible, because of the emergence of resistance. Some organisms, such as Citrobacter, Providencia, and Serratia, have the ability to become resistant through the development of cephalosporinases (these enzymes hydrolyze cephalosporins and render them inactive). Ceftriaxone is available for administration via the intramuscular or the intravenous routes. Diluents containing calcium should not be used to reconstitute ceftriaxone and it must not be administered in intravenous lines containing other calcium-containing solutions, as a ceftriaxone-calcium precipitate could form. Ceftriaxone is pregnancy category B. It has not been observed to cause birth defects in animal studies, but a lack of well-controlled studies done in pregnant women exists. Low concentrations of ceftriaxone are excreted in breast milk that are "not expected to cause adverse effects in breastfed infants." The manufacturer recommends that caution be exercised when administering ceftriaxone to women who breastfeed. Hyperbilirubinemic neonates are contraindicated for the use of ceftriaxone. It can compete with bilirubin and displace it from binding to albumin, increasing the risk of bilirubin encephalopathy. According to the package insert, clinical studies did not show differences in efficacy and safety of ceftriaxone in geriatrics compared to younger patients but "greater sensitivity of some older individuals cannot be ruled out." Although generally well tolerated, the most common adverse reactions associated with ceftriaxone are changes in white blood cell counts, local reactions at site of administration, rash, and diarrhea. Some less frequently reported adverse events (incidence < 1%) include phlebitis, itchiness, fever, chills, nausea, vomiting, elevations of bilirubin, elevations in creatinine, headache and dizziness. Ceftriaxone may precipitate in bile, causing biliary sludge, biliary pseudolithiasis, and gallstones, especially in children. Hypoprothrombinaemia and bleeding are specific side effects. Haemolysis is reported. It has also been reported to cause post renal failure in children. Like other antibiotics, ceftriaxone use can result in Clostridium difficile-associated diarrhea ranging from mild diarrhea to fatal colitis. Ceftriaxone should not be used in those with an allergy to ceftriaxone or any component of the formulation. Although there is negligible cross-reactivity between penicillins and third-generation cephalosporins, caution should still be used when using ceftriaxone in penicillin-sensitive patients. Caution should be used in people who have had previous severe penicillin allergies. It should not be used in hyperbilirubinemic neonates, particularly those who are premature because ceftriaxone is reported to displace bilirubin from albumin binding sites, potentially causing bilirubin encephalopathy. Concomitant use with intravenous calcium-containing solutions/products in neonates (≤28 days) is contraindicated  even if administered through different infusion lines due to rare fatal cases of calcium-ceftriaxone precipitations in neonatal lungs and kidneys. Ceftriaxone is a third-generation antibiotic from the cephalosporin family of antibiotics. It is within -lactam family of antibiotics. 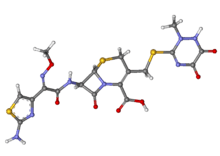 Ceftriaxone selectively and irreversibly inhibits bacterial cell wall synthesis by binding to transpeptidases, also called transamidases, which are penicillin-binding proteins (PBPs) that catalyze the cross-linking of the peptidoglycan polymers forming the bacterial cell wall. The peptidoglycan cell wall is made up of pentapeptide units attached to a polysaccharide backbone with alternating units of N-acetylglucosamine and N-acetylmuramic acid. PBPs act on a terminal D-alanyl-D-alanine moiety on a pentapeptide unit and catalyze the formation of a peptide bond between the penultimate D-alanine and a glycine unit on an adjacent peptidoglycan strand, releasing the terminal D-alanine unit in the process. The structure of ceftriaxone mimics the D-alanyl-D-alanine moiety, and the PBP attacks the beta-lactam ring in ceftriaxone as if it were its normal D-alanyl-D-alanine substrate. The peptidoglycan cross-linking activity of PBPs is a construction and repair mechanism that normally helps to maintain bacterial cell wall integrity, so the inhibition of PBPs leads to damage and destruction of the cell wall and eventually to cell lysis. Absorption: Ceftriaxone can be administered intravenously and intramuscularly, and the drug is completely absorbed. It is not available orally. Metabolism: 33-67% of ceftriaxone is renally excreted as unchanged drug, but no dose adjustments are required in renal impairment with dosages up to 2 grams per day. The rest is excreted in the bile as inactive compounds from hepatic and gut flora metabolism. Distribution: Ceftriaxone penetrates tissues and body fluids well, including cerebrospinal fluid to treat central nervous system infections. The average volume of distribution in adults is 5.8-13.5 liters. Elimination: The average elimination half-life in healthy adults is 5.8-8.7 hours. In people with renal impairment, the average elimination half-life increases to 11.4-15.7 hours. Ceftriaxone is commercially available as a white to yellowish-orange crystalline powder for reconstitution. Reconstituted ceftriaxone injection solutions are light yellow- to amber-colored depending on how long the solution had been reconstituted, the concentration of ceftriaxone in the solution, and the diluent used. To reduce pain with intramuscular injections, ceftriaxone may be reconstituted with lidocaine. The syn-configuration of the methoxyoxime moiety confers resistance to beta-lactamase enzymes produced by many Gram-negative bacteria. The stability of this configuration results in increased activity of ceftriaxone against otherwise resistant Gram-negative bacteria. In place of the easily hydrolyzed acetyl group of cefotaxime, ceftriaxone has a metabolically stable thiotriazinedione moiety. Ceftriaxone has also been investigated for efficacy in preventing relapse to cocaine addiction. Ceftriaxone seems to increase excitatory amino acid transporter-2 pump expression and activity in the central nervous system, so has a potential to reduce glutamatergic toxicity. Ceftriaxone has been shown to have neuroprotective properties in a number of neurological disorders, including spinal muscular atrophy and amyotrophic lateral sclerosis (ALS). Despite earlier negative results in the 1990s, a large clinical trial was undertaken in 2006 to test ceftriaxone in ALS patients, but was stopped early after it became clear that the results would not meet the predetermined criteria for efficacy. 1 2 3 4 5 "Ceftriaxone Sodium Monograph for Professionals - Drugs.com". www.drugs.com. Retrieved 2016-08-27. ↑ "Ceftriaxone Pregnancy and Breastfeeding Warnings". www.drugs.com. Retrieved 27 August 2016. ↑ Landau, Ralph; Achilladelis, Basil; Scriabine, Alexander (1999). Pharmaceutical Innovation: Revolutionizing Human Health. Chemical Heritage Foundation. p. 169. ISBN 9780941901215. ↑ "WHO Model List of Essential Medicines". World Health Organization. April 2015. Retrieved November 2, 2015. ↑ "Ceftriaxone". International Drug Price Indicator Guide. Retrieved 29 August 2016. ↑ Facep, Hamilton MD Faaem Facmt (2013). Tarascon Pocket Pharmacopoeia 2014 Deluxe Lab-Coat Edition. Jones & Bartlett Publishers. p. 75. ISBN 9781284053999. 1 2 3 4 5 6 7 8 Katzung, Bertram; Masters, Susan; Trevor, Anthony (2012). Basic and Clinical Pharmacology. McGraw-Hill. pp. 797–801. ISBN 978-0-07-176402-5. 1 2 3 4 5 6 7 8 9 10 11 12 13 14 15 16 17 18 19 "DailyMed - CEFTRIAXONE- ceftriaxone sodium injection, powder, for solution". dailymed.nlm.nih.gov. Retrieved 2015-11-04. 1 2 Katzung, Bertram (2009). Basic and Clinical Pharmacology, Eleventh Edition. New York: McGraw-Hill. pp. 783–784. ISBN 978-0-07-160405-5. ↑ "Update to CDC's Sexually Transmitted Diseases Treatment Guidelines, 2010: Oral Cephalosporins No Longer a Recommended Treatment for Gonococcal Infections". ↑ "TOXNET". toxnet.nlm.nih.gov. Retrieved 2015-11-04. 1 2 3 4 5 6 7 "Rocephin Prescribing Information" (PDF). Roche. Retrieved November 1, 2015. ↑ Shiffman ML, Keith FB, Moore EW (December 1990). "Pathogenesis of ceftriaxone-associated biliary sludge. In vitro studies of calcium-ceftriaxone binding and solubility". Gastroenterology. 99 (6): 1772–8. PMID 2227290. ↑ Shrimali, JD; Patel, HV; Gumber, MR; Kute, VB; Shah, PR; Vanikar, AV; Trivedi, HL (Nov 2013). "Ceftriaxone induced immune hemolytic anemia with disseminated intravascular coagulation.". Indian Journal of Critical Care Medicine. 17 (6): 394–5. doi:10.4103/0972-5229.123465. PMC 3902580 . PMID 24501497. ↑ Guleria, VS; Sharma, N; Amitabh, S; Nair, V (Sep–Oct 2013). "Ceftriaxone-induced hemolysis.". Indian Journal of Pharmacology. 45 (5): 530–1. doi:10.4103/0253-7613.117758. PMC 3793531 . PMID 24130395. ↑ Li, N.; Zhou, X.; Yuan, J.; Chen, G.; Jiang, H.; Zhang, W. (24 March 2014). "Ceftriaxone and Acute Renal Failure in Children". Pediatrics. 133 (4): e917–e922. doi:10.1542/peds.2013-2103. PMID 24664092. ↑ "The Use of Cephalosporins in Penicillin-allergic Patients". www.medscape.com. Retrieved 2015-11-10. ↑ "FDA Updates warning on Ceftriaxone-Calcium injection". ↑ Bradley JS; Wassel RT; Lee L; Nambiar S (April 2009). "Intravenous ceftriaxone and calcium in the neonate: assessing the risk for cardiopulmonary adverse events". Pediatrics. 123 (4): e609–13. doi:10.1542/peds.2008-3080. PMID 19289450. 1 2 3 4 5 6 7 Lemke, Thomas L.; Williams, David A., eds. (2013). Foye's Principles of Medicinal Chemistry (Seventh ed.). Philadelphia, PA: Lippincott Williams & Wilkins. pp. 1093–1094, 1099–1100. ISBN 9781609133450. ↑ van Heijenoort, J. (2001-03-01). "Formation of the glycan chains in the synthesis of bacterial peptidoglycan". Glycobiology. 11 (3): 25R–36R. doi:10.1093/glycob/11.3.25r. ISSN 0959-6658. PMID 11320055. 1 2 Scheffers, Dirk-Jan; Pinho, Mariana G. (2005-12-01). "Bacterial Cell Wall Synthesis: New Insights from Localization Studies". Microbiology and Molecular Biology Reviews. 69 (4): 585–607. doi:10.1128/MMBR.69.4.585-607.2005. ISSN 1092-2172. PMC 1306805 . PMID 16339737. ↑ Patel, I. H.; Kaplan, S. A. (1984-10-19). "Pharmacokinetic profile of ceftriaxone in man". The American Journal of Medicine. 77 (4C): 17–25. ISSN 0002-9343. PMID 6093513. ↑ Red Book: Pharmacy's Fundamental Reference (114th ed.). PDR Network, LLC. 2010. ISBN 9781563637513. ↑ "DailyMed - Search Results for ceftriaxone". dailymed.nlm.nih.gov. Retrieved 2015-11-04. ↑ Balant, L.; Dayer, P.; Auckenthaler, R. (1985-04-01). "Clinical pharmacokinetics of the third generation cephalosporins". Clinical Pharmacokinetics. 10 (2): 101–143. doi:10.2165/00003088-198510020-00001. ISSN 0312-5963. PMID 3888488. ↑ Wilkins, Lippincott Williams & (2012-03-07). Nursing Pharmacology Made Incredibly Easy!. Lippincott Williams & Wilkins. p. 496. ISBN 9781451146240. ↑ Nau, Roland; Sörgel, Fritz; Eiffert, Helmut (2010-10-01). "Penetration of Drugs through the Blood-Cerebrospinal Fluid/Blood-Brain Barrier for Treatment of Central Nervous System Infections". Clinical Microbiology Reviews. 23 (4): 858–883. doi:10.1128/CMR.00007-10. ISSN 0893-8512. PMC 2952976 . PMID 20930076. ↑ Schichor A; Bernstein B; Weinerman H; Fitzgerald J; Yordan E; Schechter N (January 1994). "Lidocaine as a diluent for ceftriaxone in the treatment of gonorrhea. Does it reduce the pain of the injection?". Arch Pediatr Adolesc Med. 148 (1): 72–5. doi:10.1001/archpedi.1994.02170010074017. PMID 8143016. ↑ Knackstedt LA; Melendez RI; Kalivas PW (August 2009). "Ceftriaxone restores glutamate homeostasis and prevents relapse to cocaine-seeking". Biol Psychiatry. 67 (1): 81–4. doi:10.1016/j.biopsych.2009.07.018. PMC 2795043 . PMID 19717140. ↑ Verma, Rajkumar; Mishra, Vikas; Sasmal, Dinakar; Raghubir, Ram (Jul 2010). "Pharmacological evaluation of glutamate transporter 1 (GLT-1)-mediated neuroprotection following cerebral ischemia/reperfusion injury". Eur J Pharmacol. 638 (1–3): 65–71. doi:10.1016/j.ejphar.2010.04.021. PMID 20423712. ↑ Lee SG, Su ZZ, Emdad L, Gupta P, Sarkar D, Borjabad A, Volsky DJ, Fisher PB (2008). "Mechanism of Ceftriaxone Induction of Excitatory Amino Acid Transporter-2 Expression and Glutamate Uptake in Primary Human Astrocytes". The Journal of Biological Chemistry. 283 (19): 13116–13123. doi:10.1074/jbc.M707697200. PMC 2442320 . PMID 18326497. ↑ Hedlund, E. (2011). "The protective effects of beta-lactam antibiotics in motor neuron disorders". Experimental Neurology. 231 (1): 14–18. doi:10.1016/j.expneurol.2011.06.002. PMID 21693120. ↑ Rothstein, J. D.; Patel, S.; Regan, M. R.; Haenggeli, C.; Huang, Y. H.; Bergles, D. E.; Jin, L.; Dykes Hoberg, M.; Vidensky, S.; Chung, D. S.; Toan, S. V.; Bruijn, L. I.; Su, Z. Z.; Gupta, P.; Fisher, P. B. (2005). "β-Lactam antibiotics offer neuroprotection by increasing glutamate transporter expression". Nature. 433 (7021): 73–77. doi:10.1038/nature03180. PMID 15635412. ↑ "Statement on the Clinical Trial of Ceftriaxone". The Northeast ALS Consortium (NEALS). 8 August 2012. Retrieved 10 May 2013.